Here is a list of top tips to make the most out of your money spent on slot machines. With all the bells and whistles that there are today on slot machines, things can become somewhat confusing. In some online casino such as Casino Tropez or Casino770, there are so many varieties of slot machines that it is easy to get lost and not know all the different possible pay lines. Make sure therefore that you know exactly what kind of slot machine you play (multi-lines, multipliers, progressive, etc.) and what combinations of symbols you need to get paid. The comps on live slots and registration bonus and loyalty comps for online slot machines is free playing money that compensates for the house edge. Make sure you keep an eye on online bonuses and use them whenever you can. If you play on live machines make sure that all the games that you play are taken into account towards your comps. Most slot machines these days accept multiple coins, which means that you can play more than one coin per game. Playing the maximum amount of coins will put you in a better position to win the progressive jackpot. These jackpots can be enormous so you do not want to miss the chance to win. You will need a specific bankroll that you can afford to spend and that is separate from your personal finances. You should only use a small percentage of the bankroll at each game session. Give yourself a goal, to have fun while playing for X number of hours or win an amount of $ Y. Give yourself a maximum loss figure and if you lose an amount of $ Z at any time, this means that it is time to leave. It is wrong to assume that once a machine has paid out a big win it is set to stop paying for a little while. 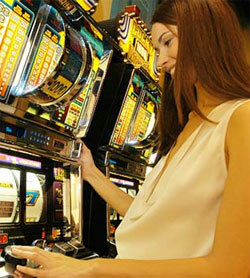 Individual spins are random and are subject to the pay-out rate to which the machine is set. The machine does not register that it has just paid out a winnings. Staying on such a machine is particularly important when you are playing live slot machines, since you do not know the pay-out rate. If you get a big win it could be that have found a machine that pays out often! So stick with it.